The basic rule for this kind of verbs is that the verb ALWAYS starts with letter Alef=أ. "I put on my clothes. Then I drink coffee. Then I go to the work"
One more thing to say..
Have questions? Feel free to use the comment box below and I will get back to you as soon as possible. A phrase that used a lot everyday; I have & I don't have. How to say these phrases in Arabic? Take a look to these illustrations for the previous examples. We use masculine and feminine expressions. Do you think there is any different?!! Take a look to these illustrations for the previous examples. As you can see, there is no different between masculine and feminine expressions. Use adjectives to describe what do you have (or don't have). Always put the adjective after the last word in the sentence. What to learn more about this subject? 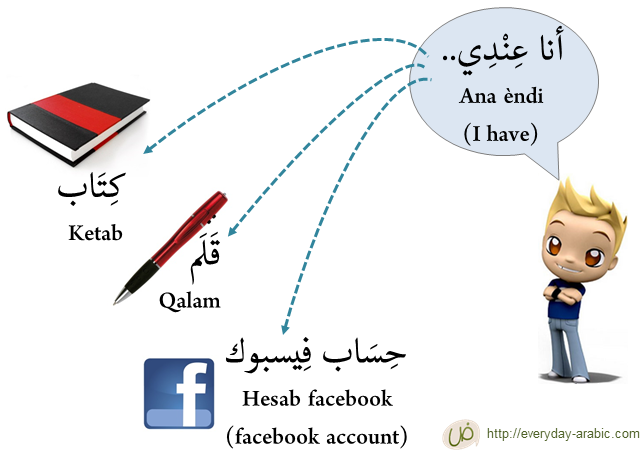 Take online Arabic lesson with Native speakers. Share what do you think about this lesson! Use comment book below to ask any question and we will replay as soon as possible. Preposition Quiz: Test your understanding by quick test in Arabic prepositions. Here Have any question about this subject? Feel free to post it in common box below, and we'll answer it as soon as possible. A very common mistake between beginners when they start learn Arabic language; they're using (لا = La) to negation any sentences. They may try to simulate the English way by using (not) which is the only element to negation in English. The truth is لا not the only element to use in negation in Arabic language! Also, لا has specific uses and conditions for negation in Arabic language. To learn when and how to use each element, take a look in this (infographic) that summarize what you need to learn. Be aware that there are other elements that are also used but not very common, and even the elements that been discussed here can have other uses and forms. Since these are uncommon elements, we didn't mention them here, but if you still want to have deep look on all negation elements, this link is a good reference for that. Our goal here is to teach you how to master negation in Arabic language for different forms: (present form - past form - order form - future form - nonverbal form) in a simple and practical way. Think with other examples as a practicing for this grammar. There are two approaches for past form: لم (= Lam) + present tense (or) ما (= Ma)+ past tense. For present, order and future forms, use the (suitable) negation element + present verb. 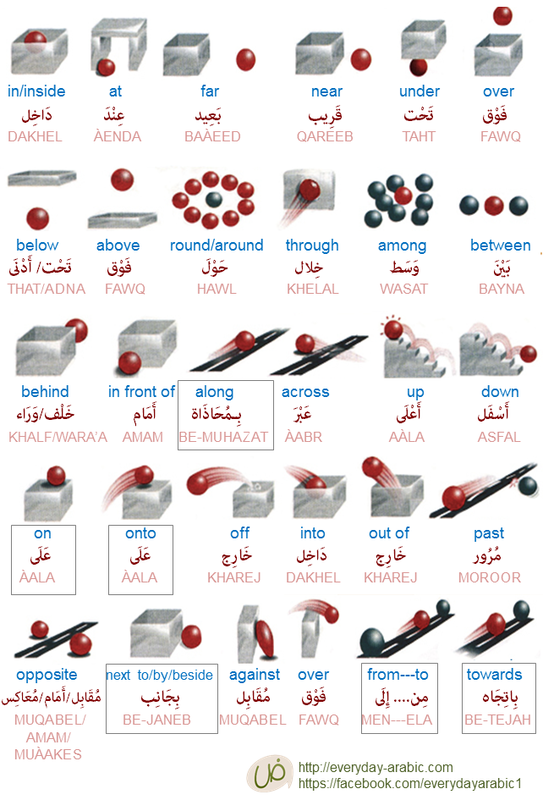 ليس (= Laisa) is for non-verbal sentences and it has to be connected with ت in the end if the thing you want to negation is Feminine, ex: ليست القصة ممتعة (= laisat al-kessatu momte'a). 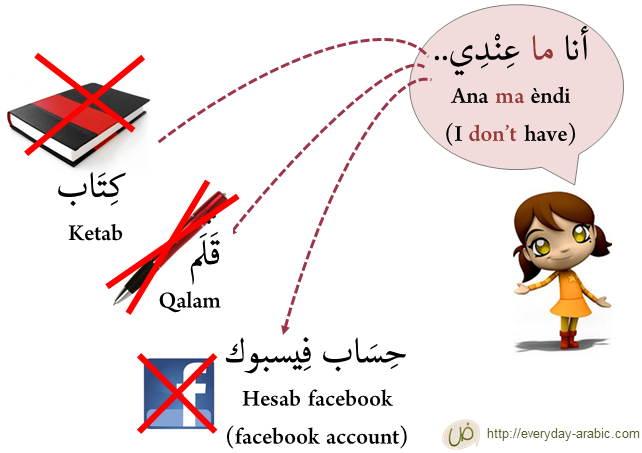 Only ليس can be switching with the noun, ex: ليس الكتاب قديما (= laisa al-ketabu qadeeman) or الكتاب ليس قديما (= al-ketabu laisa qadeeman). ليس (= laisa) can be conjugated for each person, ex: لَسْتُ (= lastu) I'm not - لَسْتَ (= lasta) you're not(M), لَسْتِ (= lasti) you're not(F) & لسنا (= lasna) we're not. With لا in Order form, the present verb has "سكون = Skoon" on the last letter instead of " ضمة = Dhamma". Also with لم, the present verb has "سكون = Skoon" on the last letter instead of "ضمة = Dhamma". With لن, the present verb has "فتحة = Fatha" on the last letter instead of "ضمة = Dhamma". With ما, the past verb has same vowels. With لا in Present form, the present verb has same vowels. With ليس & ليست, the adverb has "فتحة = Fatha" on the last letter instead of "ضمة = Dhamma". 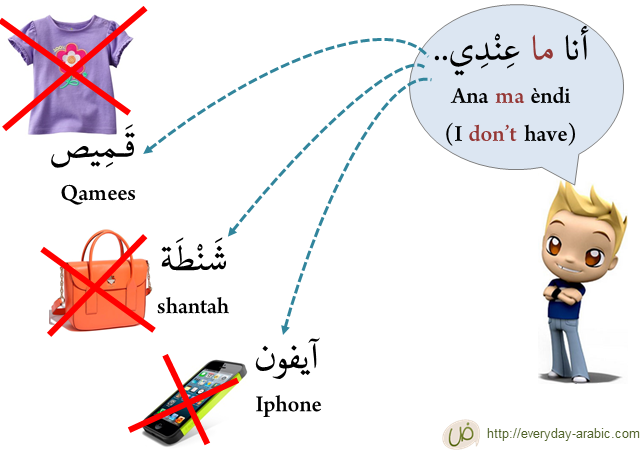 How about negation in different Arabic dialects? 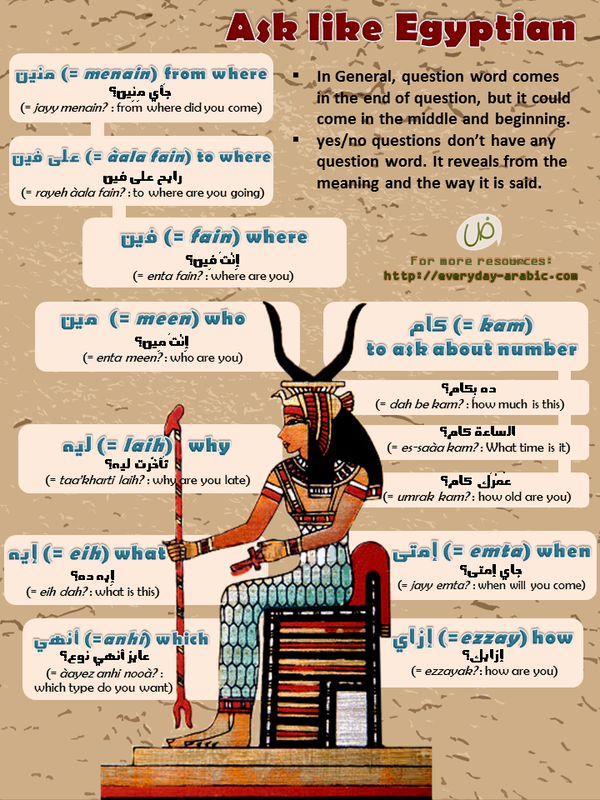 ما and لا are the most used in different Arabic dialects beside of مُشْ (= Mosh) in Egyptian dialect. We will publish soon another post about negation in Arabic Dialects. Share what do you think about this post and feel free to ask any question in comments below. I'll answer them as soon as I can. An adverb is a word that changes or qualifies the meaning of a verb. An adverb indicates manner, time, place, cause, or degree and answers questions such as "how," "when," "where," "how much". This post will discuss adverbs of place in Arabic grammar, how to use them and the word that comes after them. What is Adverb of place? It is an adverb that describes where the action of a verb is carried out. In Arabic, it called ظرف المكان (= tharfu al-makan). ظرف المكان (= tharfu al-makan) typically answer questions such as "where?". حيث (= haythu) where "the one that is used as a relative pronoun, not as a question"
The English words inside gray squares are considered adverbs of place, but the Arabic words, even though they indicate places, are considered as حرف جر (= harf jar: preposition), على - في - مِن - إلى - بـ, which are treated in different way. * هنا (= huna: here) and هُنَاك (= hunak: there) are أسماء إشارة (= asma'a esharah: demonstrative pronounces) even they indicate place, but they aren't adverb of place. * The noun after adverb of place in Arabic always is identified with article "the" الـ. 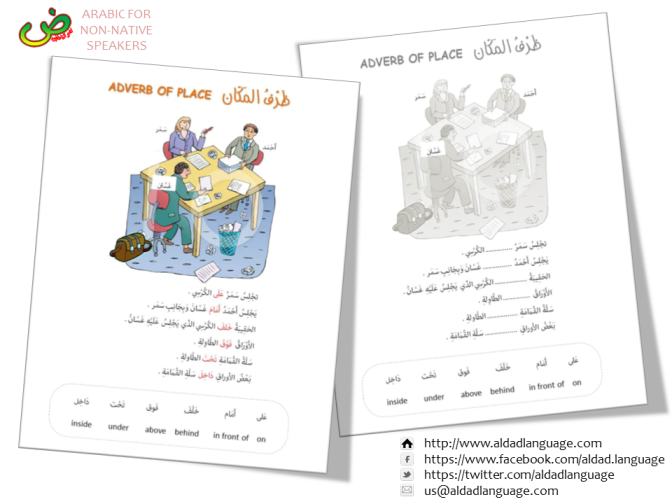 This is a worksheet to learn adverb of place in Arabic grammar. You can print the worksheet to use it for learning those adverbs and the audio file to practice on pronunciation. After you learn those Arabic adverbs very will, think with other examples to use these adverbs. You can also share your example in comments or feel free to ask any question about this subject. you need to use the right verb in the right place.